Home Remedy for Dark Neck ! 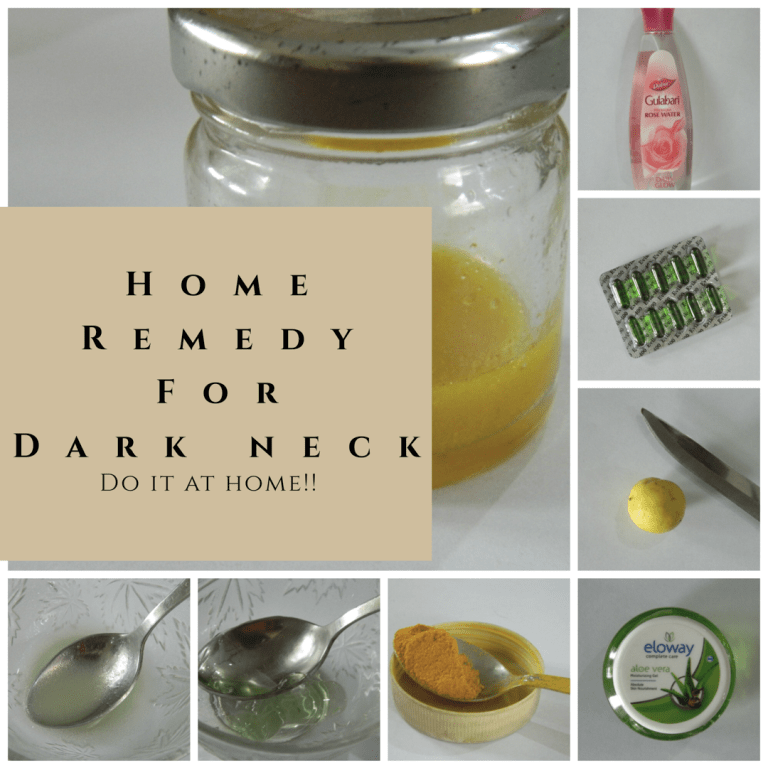 Home ReviewsBeauty Home Remedy for Dark Neck ! A dark neck is extremely unflattering. This pigmentation occurs in areas which have thick skin and multiple folds such as the neck or the underarms. There might be many products available in the market to treat this problem but there is nothing better than a home-made pack with natural ingredients. The DIY Home Remedy for Dark Neck mentioned below is one of the easiest and fastest methods to get rid of your dark neck problem. The ingredients used in this DIY Pack are also easily available at your home. Vitamin E Tablets. You can also use Vitamin E oil if you have that. Lemon helps in lightening and brightening your skin. Aloe Vera Gel – This gel helps in keeping your skin hydrated and soft. Rose Water – Rose water is used to tone the skin of your neck as well as give the pack a nice fragrance. Olive Oil – Olive Oil has been used for various medicinal purposes. Turmeric – To brighten your skin. How to make the Pack? Take one spoon of Aloe Vera Gel in a bowl. Fresh Aloe Vera Gel which has been extracted from the Aloe leaves can also be used in place of the one available in the market. Cut 2 Vitamin E capsules and pour the Vitamin E Oil in the bowl along with the Aloe Vera Gel. If you are using Vitamin E Oil directly, pour 3-4 drops into the bowl. Mix both the Gel and the Oil together to get an even consistency. Now take half-teaspoon of olive oil and mix it with the gel and oil mixture already prepared. After mixing the oil, the pack will have a milky consistency which would be translucent in nature. Lastly, add a half teaspoon of rose water. Freshly prepared rose water can also be used instead of the market purchased one. Mix the whole pack thoroughly and transfer it into a small container. Add a pinch of turmeric to your pack to make your pack more effective. Store the final mixture in a small container and keep it in the freezer for 15 minutes. The Pack will now have a thick consistency. Apply the pack all over your neck or other affected areas. As this pack contains oils, it will never dry completely on your skin. Keep the pack applied for 20-25 minutes and then remove with lukewarm water. Pat dry with a soft towel. Use this pack every day for a month to see significant results. A freshly made pack can be stored up to 1 week, given it is stored in the refrigerator. Citra Pearl Fair Face Cream with Korean Pink Pearl – Good Buy ? Himalaya Refreshing Fruit Pack – Does it Work ?